The sun is shining, the day is free and you are dying for some fresh air. What better way to spend the day than having a picnic? Fruitsuper design’s Roll Up Picnic Blankets and Pack Up Picnic Baskets are the perfect grab-and-go accessories for all impromptu beach, picnic, and park outings! Co-Founders and Designers SallyAnn Corn and Joe Kent are bringing picnics back with their grab-and-go gear. The Roll-Up Picnic Blankets feature double-sided, water-repellent fabric, heavy nylon webbing, wind-resistant corners, and a convenient pocket. 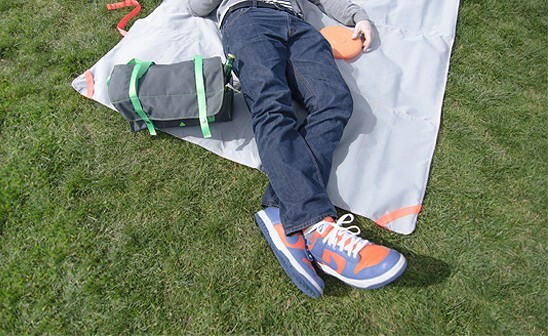 With its integrated shoulder strap and super easy snaps, you can roll up and roll out in seconds. Fruitsuper’s Pack Up Picnic Basket features double-layer, water-repellent fabric, convenient pockets, shoulder straps, and insulated lining. The baskets are designed to pack easy, keep cool, and stay dry. Fruitsuper’s simple and fun objects are easy to use so that the nostalgia of picnics are at the ready without all the hassles of planning. Just grab your fruitsuper’s Blanket and Basket, some snacks and drinks and you are ready for a perfect picnic trip! The sun is shining, the day is free and you are dying for some fresh air. What better way to spend the day than having a picnic? Fruitsuper design’s Roll Up Picnic Blankets and Pack Up Picnic Baskets are the perfect grab-and-go accessories for all impromptu beach, picnic, and park outings! Co-Founders and Designers SallyAnn Corn and Joe Kent are bringing picnics back with their grab-and-go gear. The Roll-Up Picnic Blankets feature double-sided, water-repellent fabric, heavy nylon webbing, wind-resistant corners, and a convenient pocket. 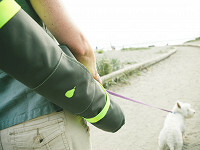 With its integrated shoulder strap and super easy snaps, you can roll up and roll out in seconds. Fruitsuper’s Pack Up Picnic Basket features double-layer, water-repellent fabric, convenient pockets, shoulder straps, and insulated lining. The baskets are designed to pack easy, keep cool, and stay dry.